This walkthrough illustrates binding a section report to a CSV data source. Note: This walkthrough uses the Products_header_tab.csv sample database. 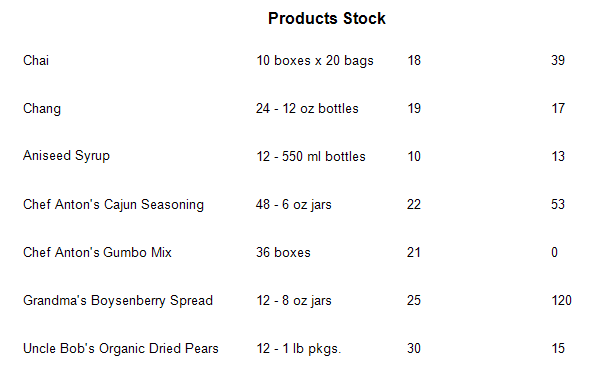 By default, the Products_header_tab.csv file is located at [User Documents folder]\GrapeCity Samples\ActiveReports 13\Data. When you complete this walkthrough you get a layout that looks similar to the following at design time and at run time. Create a new Visual Studio project. From the Project menu, select Add New Item. In the Add New Item dialog that appears, select ActiveReports 13 Section Report (code-based) and in the Name field, rename the file as rptProductsStock. Click the Add button to open a new section report in the designer. See Adding an ActiveReport to a Project for information on adding different report layouts. On the detail section band, click the Data Source icon. In the Report Data Source dialog, on the CSV tab, click the Build button next to Connection String. To specify the File Path, click the Open button and navigate to [User Documents folder]\GrapeCity Samples\ActiveReports 13\Data and select the Products_header_tab.csv file. Select the Column Separator as Tab from the drop-down menu. See the Sample CSV Connection String drop-down in CSV Data Provider topic for further details. Click OK to close the Report Data Source dialog. You have successfully connected the report to the CSV data source. Click the preview tab to view the report at design time. Open the report in the Viewer. See Windows Forms Viewer for further information.